Think history of jazz, and everybody thinks New Orleans — rightly so, as that's where it originated. 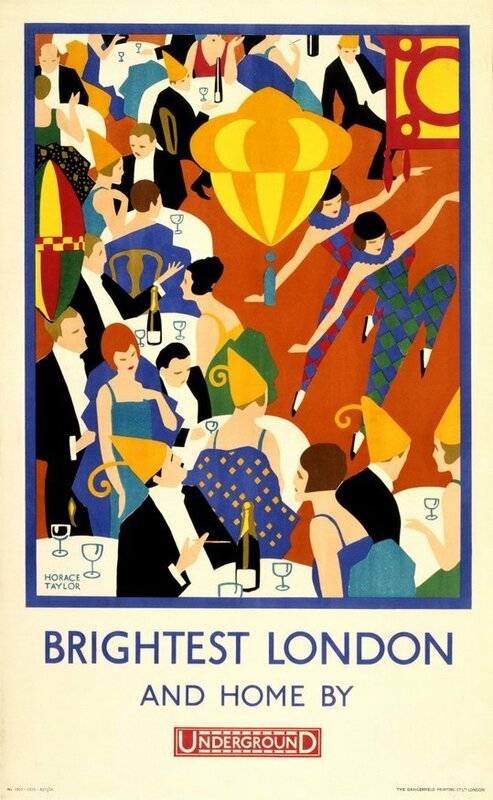 But what about the history of jazz in the UK? We must admit we knew little about this until we visited this excellent free exhibition. 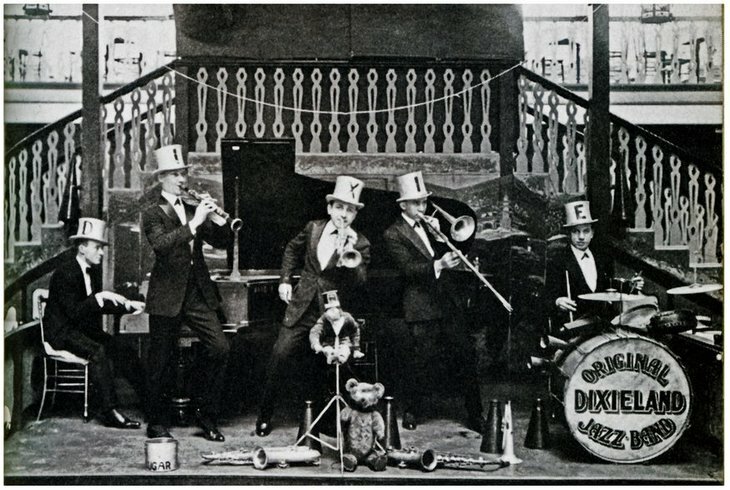 The first Dixieland band arrived in the UK in Liverpool in 1919, before moving down to London. This was a time when no jazz clubs existed and the public listened to jazz at variety theatres, which wasn't a particularly impressive experience. 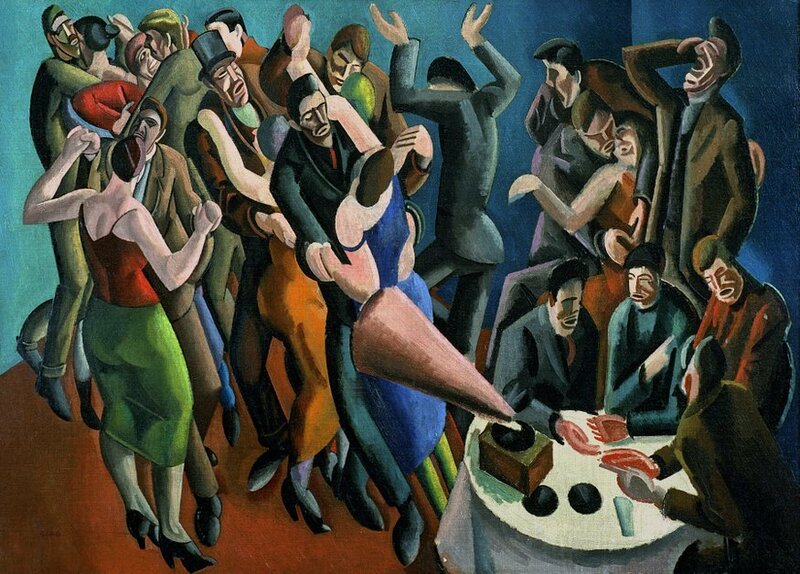 It's when jazz moved to the dance halls that it really took off, and this show charts those early years as it progressed towards the mainstream. 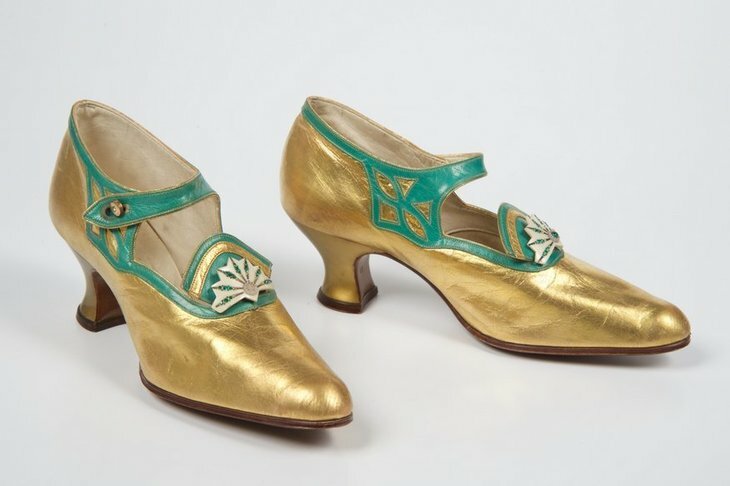 Given this rich history, the exhibition is filled with instruments including some fantastically preserved drum kits that appear to be in good enough nick that they could still be played, and fabulous art such as Frank Dobson's sculpture of two graceful intertwined dancers. A particular favourite of ours is a silent film of the High Notes, a wing walking jazz band. It looks terrifying enough just to get into one of those old biplanes — playing instruments on their wings is something we have to watch through our fingers. Now this wouldn't be a very good exhibition if we didn't hear any jazz — there's a jaunty background soundtrack playing through the show. Even our musically untrained ears are impressed by the variety within the genre. 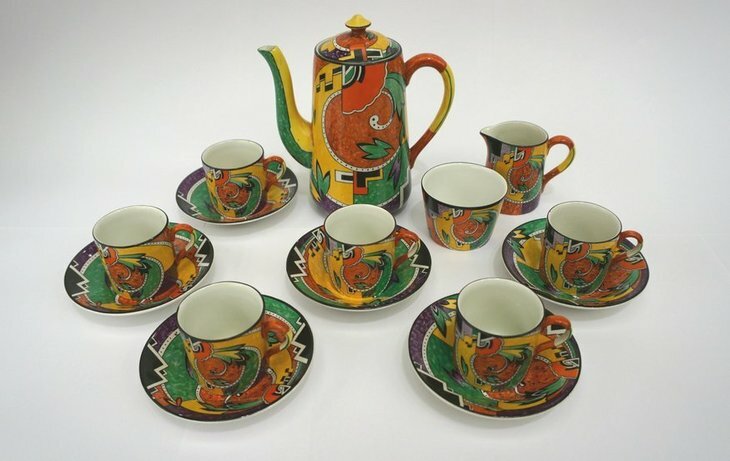 Jazz went on to inspire ceramics too — a brightly coloured coffee set from the 1930s actually looks very contemporary. Yep, we can imagine ourselves drinking a flat white out of these cups. The truly bonkers award* goes to a painting by Edward Burra of Death at a saccharine-coloured and creepy underworld. It's so out there that we still can't make up our mind as to whether it's brilliant or hideous. Importantly, the show looks at the racism first encountered by early jazz bands, who often came from the West Indies. It was rare to see jazz bands with both black and white members, though this changed when conscription for the second world war meant bands had to integrate to keep performing. Great items on show? Yes. Free to visit? Yes. Historically informative? Yes. What more could we ask for? Throw in the fact that it's hosted in a fantastic neo-Gothic mansion with a beautiful inner staircase and stained glass windows and we have a winner. Rhythm & Reaction: The Age of Jazz in Britain is on at Two Temple Place until 22 April 2018. Entrance is free. * This is an award we've just made up and there's no prize associated with it.